The Honda Eye will enable visitors to experience widespread views of the Goodwood Estate and the beautiful surrounding areas of West Sussex. The Eye will be open throughout the Festival, running in 10 minute rotations from 9am-6pm. 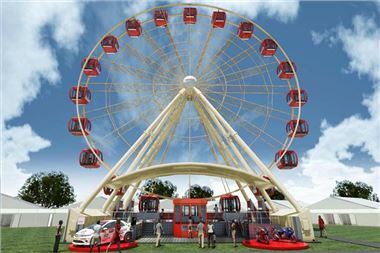 Car enthusiasts can queue for multiple rides on the attraction, free of charge. Other online activity includes Honda’s Twitter competition, where the lucky winners will take a ride in one of the VIP-themed pods, with a Honda racing driver or motorcycle rider. Among the racers are BTCC stars Matt Neal and Gordon Shedden and champion motorcycle riders Sam Lowes and Cameron Donald. Once again, Honda will be showcasing a range of cars in the Moving Motor Show; amongst them the special edition Civic Ti and BTCC replica race car. Honda will also introduce a new concept car, the CR-Z MUGEN RR, from their longstanding tuning partner MUGEN. The Goodwood Hillclimb will play host to the first public showing of the CR-Z MUGEN, a higher performance version of the sporty hybrid. Visitors will be given the opportunity to see this one-off prototype, before any other members of the public. Honda will also present potential car buyers with the chance to drive on the world famous Goodwood Hillclimb. On the main Honda stand guests can enter the ‘Win a lot of Honda’ draw, where they will be in with a chance to win one of every Honda product. This includes a car, motorcycle, mower, generator, ATV, inflatable boat and outboard engine. For race enthusiasts in the crowds, Honda TT legends John McGuinness and teammate Keith Amor will be attending with the CBR1000RR, the bike that helped McGuinness achieve the fastest ever lap of the Isle of Man. Visitors will also be able to see Gordon Shedden’s British Touring Car Championship race car, along with the new Crossrunner motorcycle and CBR600RR. Moving Motor Show on Thursday 30th June: £20 for adults, £10 for young people under 19. Friday 1st July: £37 for adults, £19.50 for young people. Saturday 2nd July: £53 for adults, £26.50 for young people. Sunday 2nd July: £53 for adults, £26.50 for young people. Four day ticket 30th June - 3rd July inclusive: £116 for adults, £58 for young people under 19. Free admission for chikdren under 12 accompanied by an adult, but you need to apply for tickets for them.